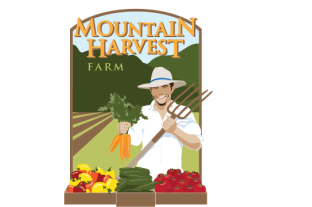 What's new at Mountain Harvest Farm? We are getting ready for the 2019 season - building a new greenhouse, ordering seeds, planning! 2019 Summer CSA Registration is open! Sign up today to get in on the healthful bounty from our farm! We grow vegetables! We love what we do, and we love to share it with you! We grow a variety of vegetables and are a Certified Naturally Grown farm, illustrating our commitment to the use of organic practices. We offer a subscription vegetable farm share program often called a "CSA" or Community Supported Agriculture program. Members enjoy a box of fresh produce every week throughout the season. We offer full (weekly) and half (biweekly) shares to meet your family's needs. Each week we curate a "Farmers Pick" box for you, or you can customize your box on your online member account - trading or adding additional items from what is available at the farm. We participate in the Morgantown Farmers Market on Saturday mornings in the pavillion on Spruce St. between June & November. We also participate in the Winter Market that is held twice a month on Saturdays from 11-1pm at the Wesley United Methodist Church. We are excited and grateful to be growing at lovely Owl Creek Farm again this year!